Read here about Professor Robert E. Skelton and his materials and space research that focuses on tensegrity. Robert E. Skelton is the Daniel L. Alspach Professor of Dynamics Systems and Controls at the UCSD Jacobs School of Engineering and a leading controls theorist. Robert Skelton, 2015. Photo by R. Skelton." For more than fifty years, Robert E. Skelton’s research has focused on integrating system science with material science to create new material systems. Skelton advanced the mathematical description of tensegrity structures. He was also involved in many other fields including the USA's first space station Skylab, the Hubble Space Telescope, robots and red blood cells. His contributions to innovative engineering serve humankind in outer space and on Earth. Skelton has championed the approach of making controls an integral part of the initial design phase of structures and engineering applications rather than tacking controls on at the end. Tensegrity is an elegant way of taking this approach. He applied this mode of analysis to the cytoskeleton of red blood cells and the molecular structure of nature’s strongest tensile material, the spider fiber. His work has focused on tensegrity shape, and how it is formed by tendon tension, and has explored adaptive materials systems that can modify their acoustic, electromagnetic, or mechanical properties. He extended this research to tensegrity structures' built-in actuators, sensors, and power-storage devices. Skelton joined the faculty at Purdue University in 1975, where he served for twenty-one years as a professor of aeronautics and astronautics. He directed the Structural Systems and Control Laboratory for Purdue’s Institute for Interdisciplinary Engineering Studies from 1991 to 1996. In 1996, Skelton moved to the University of California, San Diego (UCSD), where he founded the university’s Systems and Control Program and became director of UCSD’s Structural Systems and Control Laboratory. In 2006, UCSD named Skelton the Daniel L. Alspach Professor of Dynamics Systems and Controls in the Jacobs School of Engineering and professor emeritus in 2009. 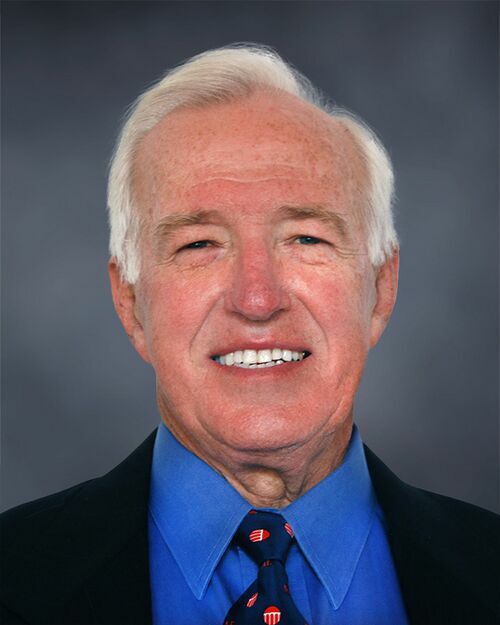 Skelton earned a bachelor’s degree in electrical engineering from Clemson University in 1963; a master’s degree in electrical engineering from the University of Alabama, Huntsville, in 1970; and a doctorate in mechanics and structures from the University of California, Los Angeles, in 1976. Skelton received the Japan Society for the Promotion of Science Award in 1986, the Humboldt Foundation Senior US Scientist Award in 1991, the Norman Medal from the American Society of Civil Engineers in 1999, and the Humboldt Foundation Research Award in 2011. The National Aeronautics and Space Administration recognized Skelton in 1974 with the SKYLAB Achievement Award and again in 2005 with a NASA Appreciation Award for his service to the Hubble repair missions. Skelton became a member of the National Academy of Engineering in 2012. He is a fellow of the Institute of Electrical and Electronics Engineers, a fellow of the American Institute of Aeronautics and Astronautics, and a life member of the Alexander von Humboldt Foundation, a non-profit foundation in Germany established to promote cooperation in international research. He has published four books: Model Error Concepts and Compensation (1986), Dynamic Systems Control (1988), A Unified Algebraic Approach to Control Design (1996), and Tensegrity Systems(2009). He has also published over one hundred papers. Skelton designed a rotating habitat with a robotic system that constructs the structure and provides a habitat growth capability. The tensegrity technology allows minimum mass of both the habitat and the robotic system. The tensegrity-based evolvable habitat design solves three critical technical problems that NASA must address: the biological effects of microgravity on humans in long duration space flight, the long duration biological effects of ionizing radiation on human physiology in deep space (beyond the Earth’s magnetosphere) and, the need for outposts in deep space to evolve dynamically over time as mission needs grow. These Growth-Adapted Tensegrity Structures (GATS) benefit NASA's evolvable proving ground approach to human exploration. 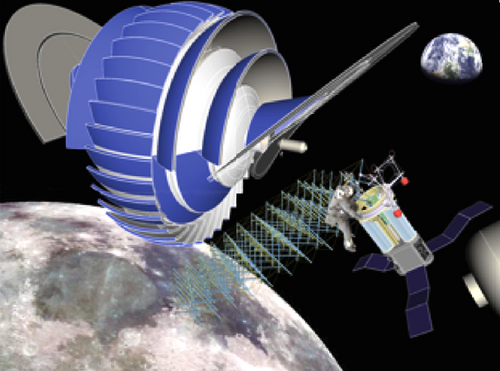 Skelton is conducting mission studies showing how a version 1.0 outpost in Lunar Distance Retrograde Orbit (LDRO) made from GATS can grow and evolve while utilizing asteroid resources for radiation shielding and later integrate with an asteroid ISRU system. He will perform mission analysis showing how asteroid regolith slag left over from the production of rocket propellant can be accumulated over time in LDRO and integrated as radiation shielding into the structure of the GATS based evolvable outpost. The critical enabling technology for our GATS technology is Tensegrity Engineering, where new design methods, new dynamic models, and new control approaches are specialized for networks of axially-loaded elements, allowing the structural mass to be minimized, while the dynamic response can be controlled with minimal energy, with repairable, growable structural methods, using tractable analytical tools that are now available. The design capitalizes on asteroid resources for radiation shielding of our habitat. In May 2016 this project was one of NASA's eight awards with "the potential to transform future aerospace missions" which will receive funding under Phase II of its NASA Innovative Advanced Concepts (NIAC) Program. The awards of up to $500,000 over two years will allow the recipients to advance their ideas, which "successfully demonstrated initial feasibility and benefit" during NIAC's Phase I. This NIAC Phase II effort will perform critical proof of concept studies, analysis, and ground demonstrations to prove the feasibility of Growth-AdaptedTensegrity Structures (GATS) and their benefit for NASA's evolvable proving ground approach to human exploration. "My training in control came from an electrical engineering perspective. But to solve control problems for real dynamical systems, modeling issues demanded most of my time. This prompted the pursuit of a degree in dynamics. This combination of the two disciplines flavors the point of view on everything I have to say here. What I learned about the intersection of the dynamics and control disciplines was more important than anything I learned about either discipline. While each discipline is relatively mature, their intersection is still in its infancy. A significant focus of my research is to develop scientific methods for the simultaneous design of multidisciplinary components of systems. Mathematically, this problem is characterized by a statement of performance requirements for the overall system, and the design specifications for the components must be derived from the system requirements. "It might be said that physics paved the way for technology in the first half of the 20th century, and engineering paved the way in the second half. What will drive and enable new technology as we round the corner of the new millennium? Engineering has produced sophisticated component technologies without instructions how to put them together. We have multidisciplinary problems searching for an interdisciplinary theory. So, I believe that systems will be the enabler of technology in the next few decades. I believe that the next grand challenge is to give the soul of control a body, to enlarge the tools of control theory to embrace the much more general problem of system design. Traditional control theory assumes that all other components have been designed except the control component. By system design we refer to the task of determining the design requirements of the multiple components that make up the system, given only the requirements of the system." This integration is one of the many benefits of tensegrity as a paradigm. In particular, tensegrity structures can be designed to achieve desirable mechanical properties in relation to rigidity and stiffness. In his Introduction To the Mechanics of Tensegrity Structures, Skelton summarized these qualities. Beams made from tensegrity units can be stiffer than their continuous beam counterparts. Pretension can be used to maintain a constant bending rigidity over a wider range of external loads. This can be important to robustness, when the range of external loads can be uncertain. For larger loads the bending stiffness is dominated by geometry, not pretension. This explains the mass efficiency of tensegrity structures since one can achieve high stiffness by choosing the right geometry. The ratio of mass to bending rigidity of the C2T4 tensegrity is shown to be smaller than for a rectangular cross-section bar, provided the geometry is chosen properly (angle between bars must be less than 53°). Comparisons to a conventional truss would be instructive. There are many possibilities. Tensegrity Systems by Robert E. Skelton and Mauricio C. de Oliveira, Springer, 2009. Skelton reviews tensegrity in general, then focuses on the perspective of static and dynamic analysis. It is the first book on tensegrity structures written to attempt to integrate structure and control design. All other books on structure design and books on control design assume these are independent topics, but performance can be greatly improved if the dynamics of the structure and the dynamics of the controls are coordinated to reduce the control efforts required to accomplish the system performance requirements. Skelton and his team divide tensegrity structures into 3 classes. //Class 1//. A two stage tensegrity structure whose internal geometry and shape are reconfigurable for deployment and non-symmetric applications. //Class 2.// A two stage tensegirity structure whose internal geometry and shape are reconfigurable for deployment and lifting applications. In addition, stiffness modifications can be accomplished via shape change while keeping certain structural constraints constant, such as total height of the boom. //Class 1.// A three stage tensegrity structure with piezo-electric force actuators and sensors for active damping of vibrations. This experiment also demonstrates the modes of vibration of a typcial tensegrity structure. Parabolic-dish: //Class 1.// A nine stable unit tensegrity structure that is reconfigurable and can be used as a deployable parabolic dish. //Class 1.// A "Planar Tensegrity Cross" structure that utilizes shape memory alloys for locomotion via shape change. //Class 1.// A Tensegrity "Stewart Platform-like" structure where bar lengths are controlled. Aldrich, J.B., Skelton, R.E., Kreutz-Delgado, K., Control Synthesis for a Class of Light and Agile Robotic Tensegrity Structures, Proceedings of 2003 American Control Conference, Denver, pages 5245-5251. Aldrich, J.B., Skelton, R.E., Control/Stucture Optimization Approach for Minimum-time Reconfiguration of Tensegrity Systems, Smart Structures and Materials: Modeling, Signal Processing and Control, San Diego, CA, Proceedings of SPIE Vol. 5049 (2003), pages 448-459. Bossens, F., de Callafon, R.A., Skelton, R.E., Modal Analysis of a Tensegrity Structure - an experimental study. ??? 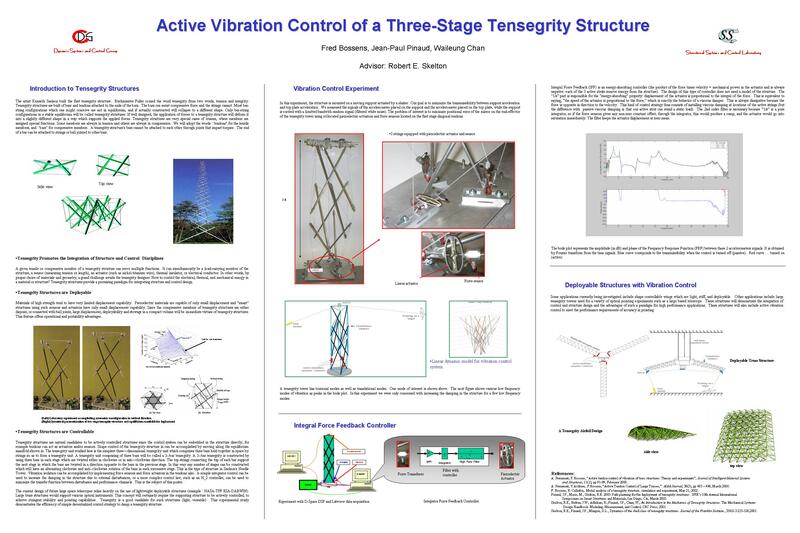 Chan, W., Arbelaez, D., Bossens, F., Skleton, R.E., Active vibration control of a three-stage tensegrity structure. SPIE 11th Annual International Symposium on Smart Structures and Materials, San Diego, California, USA, March 2004. Chan, W., Skelton, R.E., Equilibria and Stiffness of Planar Tensegrity Structures. AAS /AIAA Space Flight Mechanics Meeting, San Antonio, Texas, January 2002.
de Jager, B., Masic, M., R.E. Skelton, Optimal Topology and Geometry for Controllable Tensegrity Systems, 15th IFAC World Congress, Barcelona, Spain, 2002. Han, J., Williamson, D., Skelton, R.E., Equilibrium Conditions of a Tensegrity Structures, International Journal of Solids and Structures, 40, Nov. 2003, pp. 6347-6367. Masic, M., Skelton, R.E., Equilibrium Analysis and Open-Loop Shape Control of Modular Tensegrity Structures, submitted to AIAA Journal of Guidance, Control and Dynamics. Masic, M., Skelton, R.E., Open Loop Control of Class-2 Tensegrity Towers. SPIE’s 11th Annual International Symposium on Smart Structures and Materials, San Diego, CA, March 2004. 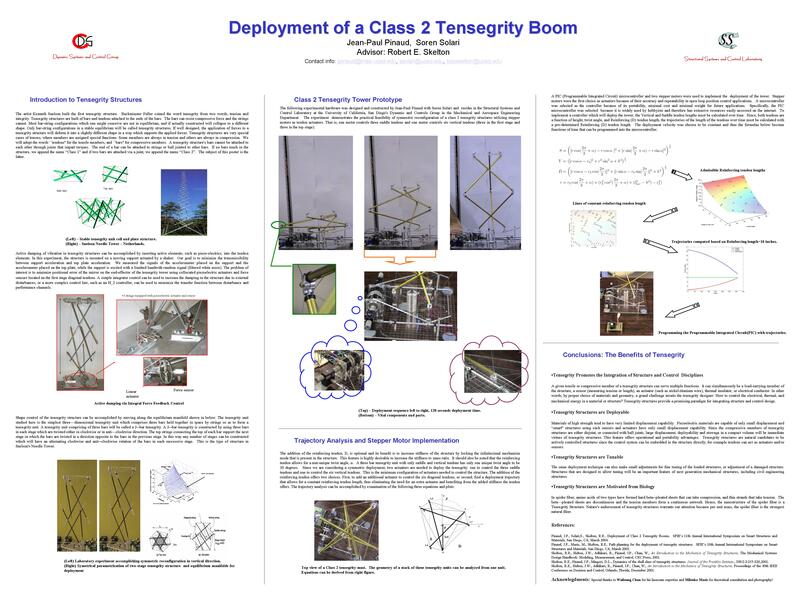 Masic, M., Skelton, R.E., Optimization of Class-2 Tensegrity Towers. SPIE’s 11th Annual International Symposium on Smart Structures and Materials, San Diego, CA, March 2004. Pinaud, J.P., Masic, M., Skelton, R.E. Path planning for the deployment of tensegrity structures. SPIE’s 10th Annual International Symposium on Smart Structures and Materials, San Diego, CA, March 2003. Pinaud, J.P., Solari, S., Skelton, R.E. Deployment of a Class 2 Tensegrity Boom. SPIE’s 11th Annual International Symposium on Smart Structures and Materials, San Diego, CA, March 2004. Skelton, R.E., Pinaud, J.P., Mingori, D.L., Dynamics of the shell class of tensegrity structures. Journal of the Franklin Institute., 338/2-3:255-320, 2001. Skelton, R.E., Helton, J.W., Adhikari, R., Pinaud, J.P., Chan, W., An Introduction to the Mechanics of Tensegrity Structures. The Mechanical Systems Design Handbook: Modeling, Measurement, and Control, CRC Press, 2001. Skelton, R.E., Helton, J.W., Adhikari, R., Pinaud, J.P., Chan, W., Dynamics of the shell class of tensegrity structures.The Mechanical Systems Design Handbook: Modeling, Measurement, and Control, CRC Press, 2001. Skelton, R.E., Helton, J.W., Adhikari, R., Pinaud, J.P., Chan, W., An Introduction to the Mechanics of Tensegrity Structures. Proceedings of the 40th IEEE Conference on Decision and Control, Orlando, Florida, December 2001. Skelton, R.E., Williamson D., Han, J., Equilibrium Conditions of a Class I Tensegrity Structure (AAS 02-177), pp 927 – 950, Volume 112 Part II, Advances in the Astronautical Sciences, Spaceflight Mechanics 2002. Williamson, D., Skelton, R.E., Han, J., Equilibrium Conditions for a Class I Tensegrity Structures, Revue française de génie civil, July, 2003, pp. 291-310. Williamson, D., Skelton, R.E., Han, J., Equilibrium Conditions of a Tensegrity Structures, Third World Conference on Structural Control (3WCSC), Como, Italy, April 7-12, 2002. Some articles by Skelton and his collaborators. An Introduction to the Mechanics of Tensegrity Structures by Skelton, 2002. A strategy for tensegrity structures deployment. See also Robert Skelton website, http://maeresearch.ucsd.edu/skelton/. Modal Analysis of a Tensegrity Structure by Bossens, Callafon, Skelton. Journal Of Guidance, Control, And Dynamics Vol. 23, No. 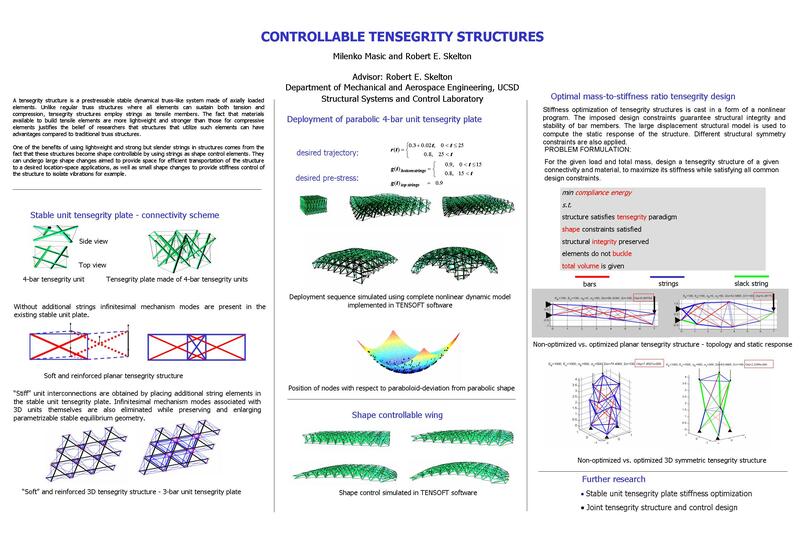 6, November– December 2000, Tensegrity Flight Simulatorm, In this paper we propose a new motionsimulatorbased on a tendon-controlledtensegrity structure. The simulator is equipped with a nonlinear controller that achieves robust tracking of desired motions. Abstract: This paper demonstrates a procedure to design an optimal mass to stiffness ratio tensegrity structure.